Affiliations: Father Neptune (see Comments), Netar, Egbert "Eggie" Cortland, "Beans"
Enemies: Commander Ritter, Nazis, Rudolph, "Reggie"
Powers/Abilities: Subbie is amphibious, and is able to survive in the ocean depths as easily as he does above the surface. He is a superb swimmer, fast enough to keep up with a diving submarine, and possesses superhuman strength, strong enough to throw a life raft with two men in it clear out the water, and a degree of superhuman durability, sufficient to only be stunned by a large Navy shell exploding a few feet from him. 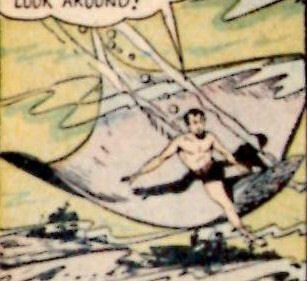 Unlike his larger counterpart, the Sub-Mariner, he could not fly. He wears a "streamlined, Navy sailor suit" given to him by Father Neptune (see Comments), and drives a small P.T. Boat, also a gift from Neptune. 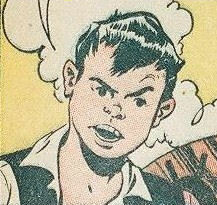 History: (Kid Komics #1) - Subbie grew up in the depths of the ocean, initially content with staying in his own "yard." However, one day while out riding his ray, Netar, he decided to venture further than he had ever been before, and caught sight of wrecked ships and U-boats lying on the oceon floor. Feeling a wanderlust, he returned home to seek counsel from his godfather, Father Neptune. Having anticipated this day eventually coming, Father Neptune gave Subbie his blessing, told him to go to the surface, where he would find a worthy craft and fitting clothing, and requested he use them wisely. On the surface Subbie found a sailor suit and small P.T. boat; donning the suit, he set off on the boat to explore, and as he neared the Atlantic shore of the United States, he witnessed a blond-haired youth in a speedboat arrogantly capsize a dark-haired boy's smaller dinghy. When the second lad yelled angry insults at the first, the blond boy returned to the overturned vessel to confront him, and a fight ensued, until they both slipped off the speedboat's bow and were knocked unconscious. Subbie swiftly dove in and rescued the drowning pair, but as soon as they awoke the argument restarted. Threatening to break both their necks if they continued their stupidity, Subbie ended the fight. Forcing a truce, he got the pair to introduce themselves and tell their stories: the blond boy was Egbert Cortland, who had slipped out past the harbor master to watch some the shore batteries practice their target shooting up close, while the dark-haired lad was "Beans", who had just been out fishing. However, just as the introductions ended, the trio witnessed the shore batteries' target suddenly begin moving towards an incoming convoy. "Beans" swiftly realized that someone was trying to trick the shore batteries into firing on the convoy. Subbie pursued in his PT Boat, and once the target came to a half, he jumped in the sea to investigate what had moved the target, ordering "Beans" and Egbert to warn the convoy. Under the surface Subbie spotted a U-Boat ("an iron whale! "); when the U-Boat detached itself from the cables it had used to tow the target, Subbie swiftly tied the cables to the U-Boat's "fins" (its propellers). Subbie surfaced near the target just as the shelling commenced; one exploded near to him, stunning the sea lad, but Egbert and "Beans" risked their lives weaving the P.T. Boat between the shells to rescue their friend. Meanwhile, under the water, the U-Boat proved less fortunate; unable to dive or pull away fast enough thanks to Subbie's sabotage, they were destroyed. The trio witnessed the U-Boat's fate, then returned to the convoy, where they were greeted as heroes. Once aboard one of the convoy ships, "Beans" asked Egbert if he had noticed anything funny about Subbie, such as how strong he was, the way he swam, and how mysterious he was, and Egbert noted in response that Subbie reminded him of the Sub-Mariner. Unaware that both his new friends were wondering about him, Subbie grinned, having enjoyed his first escapade above the waves. 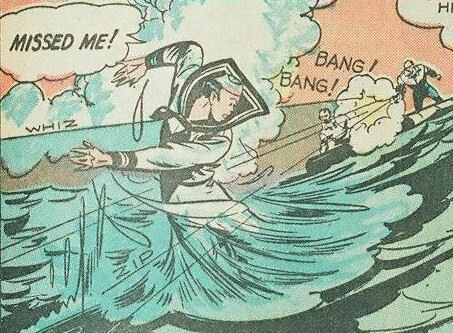 (Kid Komics #2) - Out patrolling, Subbie spotted a life raft floating in the ocean, and swiftly moved closer to rescue what he presumed to be survivors from a torpedoed freighter. However, the two men in the raft angrily told Subbie to go away, insisting they didn't want to be rescued. Smelling a rat, Subbie departed, but anchored his ship as soon as he was out of sight, and swam back to see what the men were really up to. As he approached unnoticed, Subbie witnessed a U-Boat surfacing next to the life raft, and the two men shared Nazi salutes with an officer who appeared atop the U-Boat's tower. Eavesdropping, Subbie learned that the life raft was a decoy, and that the U-Boat was radioing out S.O.S. calls, claiming to be the freighter S.S. Helena, with the intention of torpedoing any Allied vessels that came to the "survivor's" rescue. Subbie pursued the diving U-Boat, and when he spotted an American merchant ship approaching in response to the distress calls, Subbie clamped his hands over the U-Boat's periscope, forcing them to surface so they could see their target. As a lookout on the merchantman spotted Subbie and then the periscope, Subbie called out to the U.S. vessel that he was atop a Nazi U-Boat, informing them they needed to ram the Axis vessel before it could fire. Subbie dived clear just in time as the huge merchant ship collided with the U-Boat just as it surfaced, cleaving the submarine in two. Subbie then returned for the two "survivors", dodging their gunfire before capsizing the raft. Unwilling to let even Nazis drown, he took the two men prisoner, then handed them over to the sailors on the merchant ship. When an officer asked Subbie what he was doing out on the ocean on his own, Subbie swiftly jumped over the side and swam away. Comments: Subbie's creators remain unidentified. Some sites speculate, but none seem to know for sure, so I'm not going to list any of what look to be guesses. 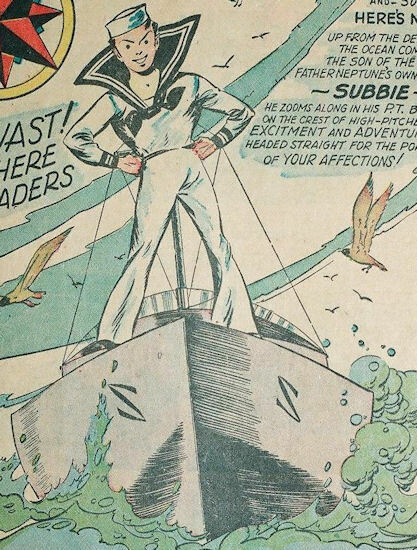 Subbie's sailor outfit has no apparent powers, making you wonder why Neptune felt the need to give him it (outside of the potentially dubious desire to dress up young boys as sailors) - that he asked Subbie to use "them" (both clothes and PT boat) wisely suggests the suit has some properties (or we're back to "how could a young boy use a perfectly normal, non-powered sailor suit unwisely?..."). Perhaps the suit is indestructible or helps Subbie to cope being out of water for a longer time (he's never actually seen out of the water without it, albeit he only has two appearances to work from). Father Neptune is presumably the real Neptune, a.k.a. 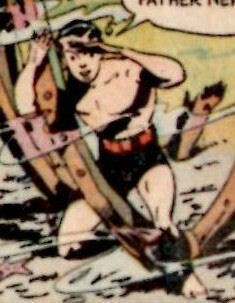 Poseidon, and, indeed, his appearance in Kid Komics #1 has been treated as his first appearance in Neptune's handbook profile. There is, however, the possibility that Subbie's Father Neptune is an imposter, though the question then arises - who is he really? Subbie's relationship to Namor the Sub-Mariner is uncertain - "Beans" openly wonders if there is some connection. Subbie's relationship to Father Neptune is also uncertain - within the space of the first two pages of Subbie's initial story, Neptune is called both Subbie's uncle and his godfather. Certainly, it is possible for someone to be both, but I doubt there was any real blood relationship. If Father Neptune is a genuine relative, then presumably Subbie is a Greek demi-god and the offspring of either Zeus or Pluto, more likely the former given his propensity to sleep with any female he could lay his hands on. One possible theory to account for both the resemblance to Namor and the alleged relationship to Neptune would be that Zeus had his wicked way with an Atlantean wench, possibly a relation of Namor's mother Fen, and Subbie is the resultant offspring of that union. Alternatively, Subbie might simply be another Atlantean hybrid or a clone of Namor (as Namorita is a clone of Namora), but that wouldn't explain why he was being watched over by Father Neptune and not part of Atlantean society. Or maybe he is some sort of homunculi created by Father Neptune in Namor's image, though again, you have to wonder why he'd create one. At the end of the day, with only two appearances to work from, we only have speculation. The last panel of Subbie's story in Kid Komics #2 promises more Subbie adventures "next issue", but instead it turned out to be his final outing. Some sort of ray, Netar was Subbie's companion and steed. When Subbie went exploring above the surface, he left Netar behind in the depths. Eggbert was an apparently well-off young lad (he had his own speedboat, and "Beans" called him a "moneybags"). He slipped out past the harbor patrol to watch the target-shooting close at hand, but carelessly capsized "Beans" less flashy vessel. When "Beans" called out at him angrily, Eggbert came back to confront him, and they fought, both ending up in the sea. Subbie rescued them both and chastized them for their stupidity. When the trio of new friends witnessed the target moving, they realized someone was trying to trick the shore batteries into opening fire on an incoming convoy. Both boys then assisted Subbie, warning the convoy to change course while Subbie dealt with the U-Boat that had moved the target. Despite the danger from detonating shells, the pair then took the P.T. Boat back towards the target to rescue Subbie. 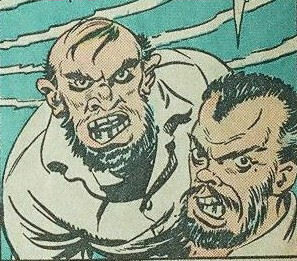 After the adventure ended, "Beans" proved he now considered Egbert a friend by giving him a nickname, Eggie, and the two speculated as to how their mysterious new friend might be related to Namor the Sub-Mariner. Only identified himself by his nickname, Beans was a lad from the wrong side of the tracks, tough but good hearted (no, none of this is said, but look at his nickname, his speech patterns and his face with the imperfect teeth - he's a 1940s stereotype, cut from the same cloth as Knuckles from the Young Allies and Scrapper from the Newsboy Legion). He was out fishing when Egbert capsized his boat. The pair fought briefly after Egbert fished Beans out the water, but put aside their differences to help Subbie fight the Germans. After the trio of new friends saw the target moving, Beans was the first one to realize what the Nazis were trying to do. He joined Egbert in warning the convoy to change course, and in returning to rescue Subbie once the shelling commenced. After the adventure ended, "Beans" dubbed Egbert "Eggie", and the pair speculated about the mysterious Subbie's true origins. Hopefully Beans earned his nickname because others thought him "full of beans" - e.g. enthusiastic, and not because he ate a lot of beans or suffered from excessive wind. Ritter was the vicious commander of a German U-117 U-Boat. Locating a large floating target intended to be used for target practice by American shore batteries, Ritter had it attached by a winch to his U-Boat, then pulled it into line with an incoming convoy, aware that the sea haze would prevent the shore men from spotting the ships in the convoy. Having repositioned the target, he then tried to move away before the shelling began, but Subbie and his friends had witnessed the move, and Subbie tied the cable's the U-Boat had used to move the target around the U-Boat's propellers. Unable to move away from the shelling, the U-Boat was swiftly sunk, presumably killing all on board, Ritter included. Rudolph and "Reggie" were two Nazis who posed as survivors from a torpedoed ship, hoping to lure in Allied ships to be torpedoed by their U-Boat. 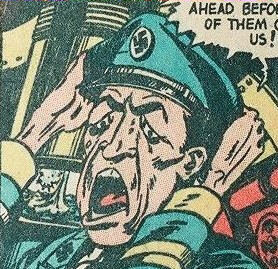 They reacted angrily when Subbie tried to rescue them, his tiny vessel not worth their interest, but refusing Subbie's help alerted his suspicions, and he ultimately caused their U-Boat's distruction. The sole survivors, as they were still in the life raft, Rudolph and "Reggie" were then apprehended by Subbie and handed over to the sailors on the merchant ship that had been their intended target. Rudolph is the one on the left of picture. The other Nazi wasn't named, but since he was with Rudolph, for ease of reference I have called him "Reggie", one of the alternate names considered for Rudolph the Red-Nosed Reindeer when the famous poem was being written.